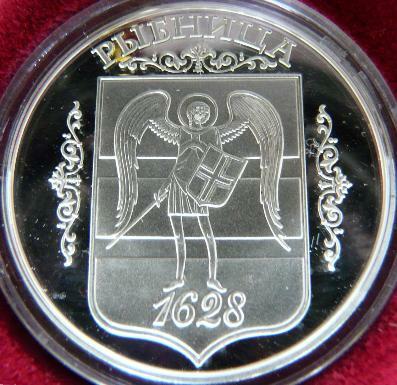 The coin represents the coat of arms of the city of Rîbniţa. It belongs to a series comprising coins with coat of arms. 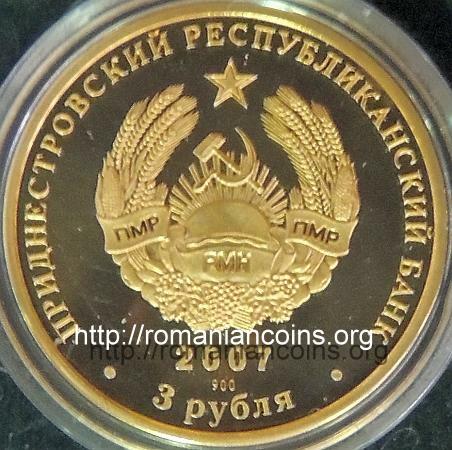 From the same series are the coins with the coat of arms of the cities of Tighina (Bender), Tiraspol and Grigoriopol, the last two placed in Transnistria, on the left bank of River Nistru. There are also gold variants of these silver coins. 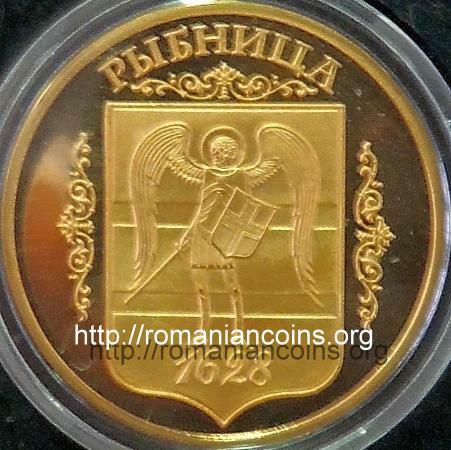 On Romanian coins another piece in gold can be seen: 3 roubles 2008 with the coat of arms of Tighina. Rîbniţa is a town on the left bank of River Nistru, belonging to the Republic of Moldova. Nowadays it fell in the separatist zone of the Transnistrian self proclaimed Moldavian republic. At 1628 Rîbniţa was part of Polish kingdom, being a village inhabited by Moldavians. The coat of arms of Rîbniţa depicts Archangel Michael, wearing plate armor, with the sword in the right hand and with a shield in the left hand. 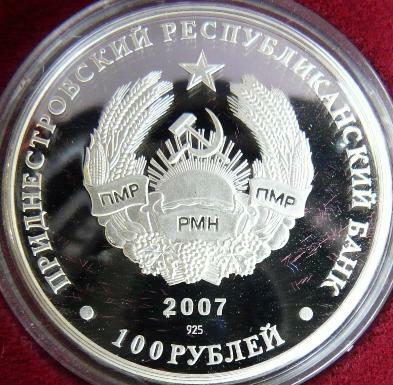 The Orthodox church Arhangel Michael of Rîbniţa is depicted on two Transnistrian coins, silver 100 rubles and golden 1000 rubles, both issued in 2006. As a toponym, Rîbniţa is an old Romanian word meaning fishing pond. It is Slavic originated (from Slavic rîba - ryba, fish). Two important Romanian cities exist in Walachia, their names having the same meaning the same linguistic origin . Their name has evolved in the shape of Rîmnic.